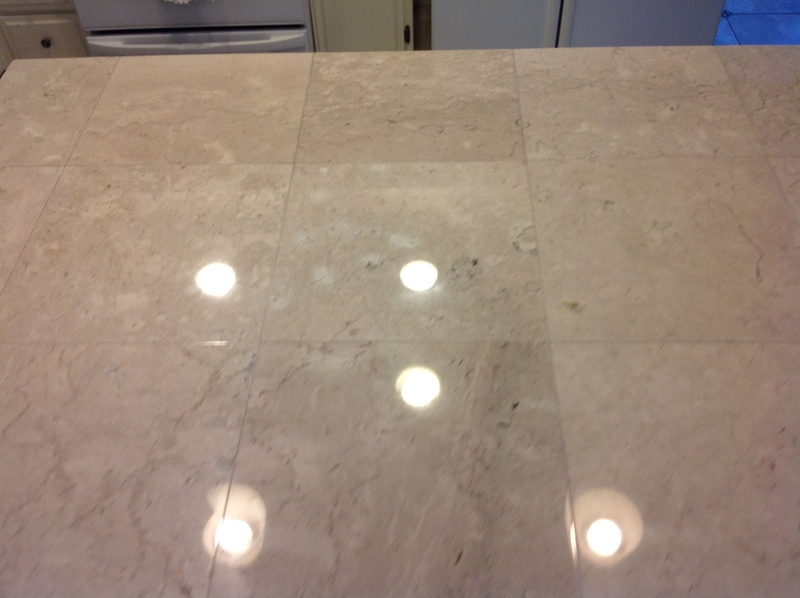 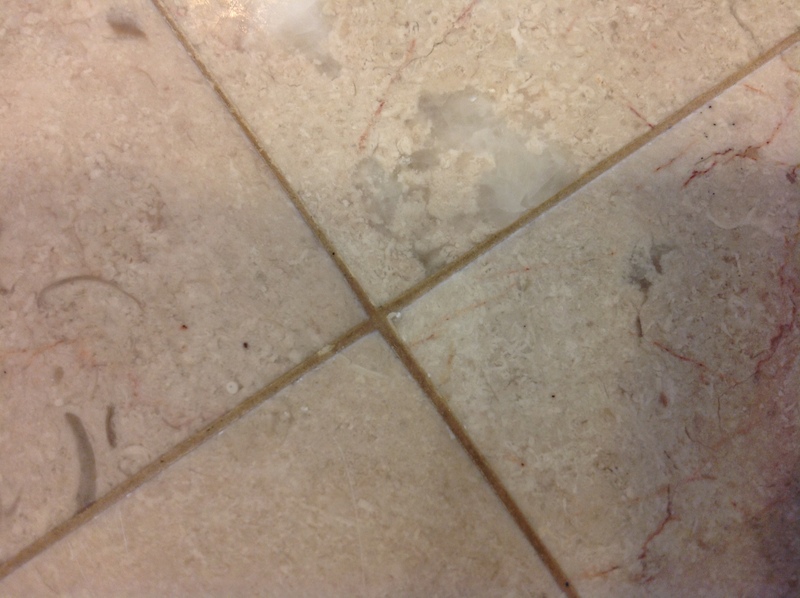 This small island in the middle of the kitchen was badly etched by a chlorine based disinfectant cleaner, and left these dull spots by the hundreds all over the Cream of Marfeil marble tile . 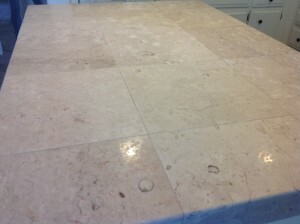 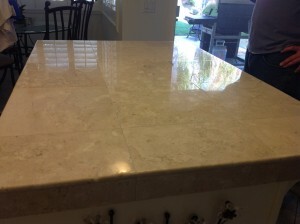 The marble countertop just did not match the beautiful home in Sunset District San Francisco. 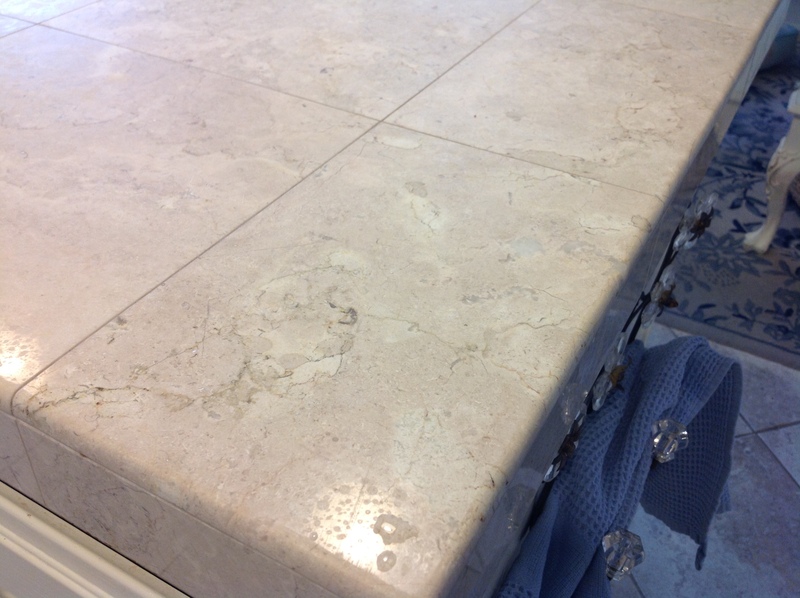 The marble had some really light burns and some really deep burns where the cleaner obviously puddled and sat on the tiles for awhile. 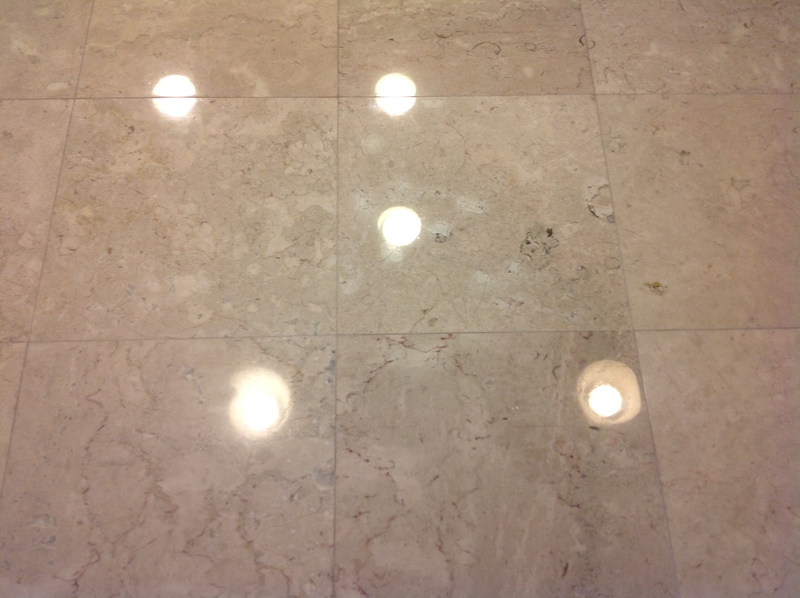 It was hard to get good visible pictures but if you look at the lights reflecting off the marble tile, you can see how cloudy and fuzzy the light looks as well as some of the dull spots & burns. 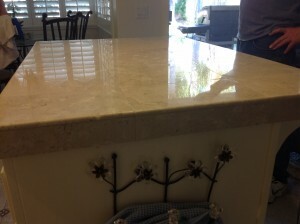 Funny thing is when I pulled out my camera to take these before pictures, the homeowner was not too thrilled about being put on the spot, but after the finished result, she was more than willing to oblige. 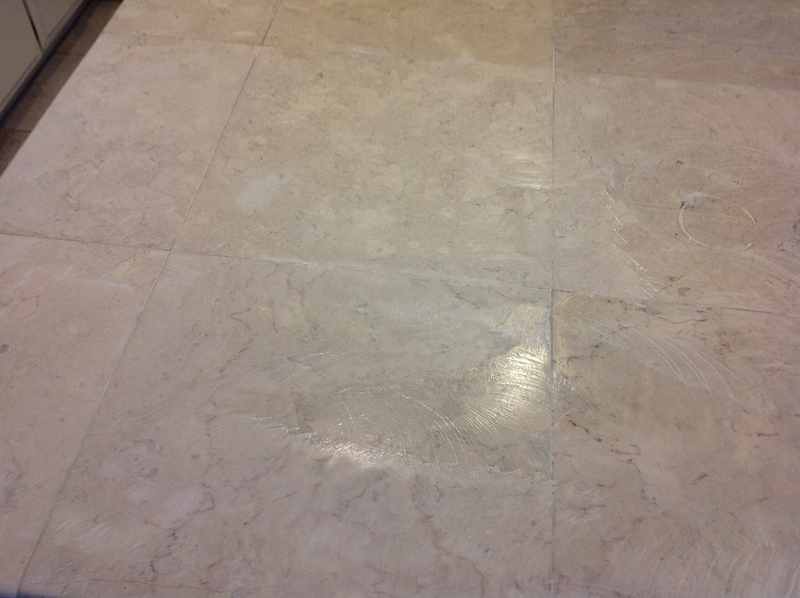 I can see that it’s been awhile since the chlorine based cleaner was used, because all the spots are caked full of early oily dirt. The antique white non-sanded grout was also real discolored from the oily, greasy residue left from cooking and improper cleaners and cleaning techniques. 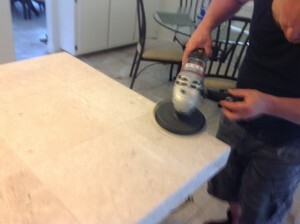 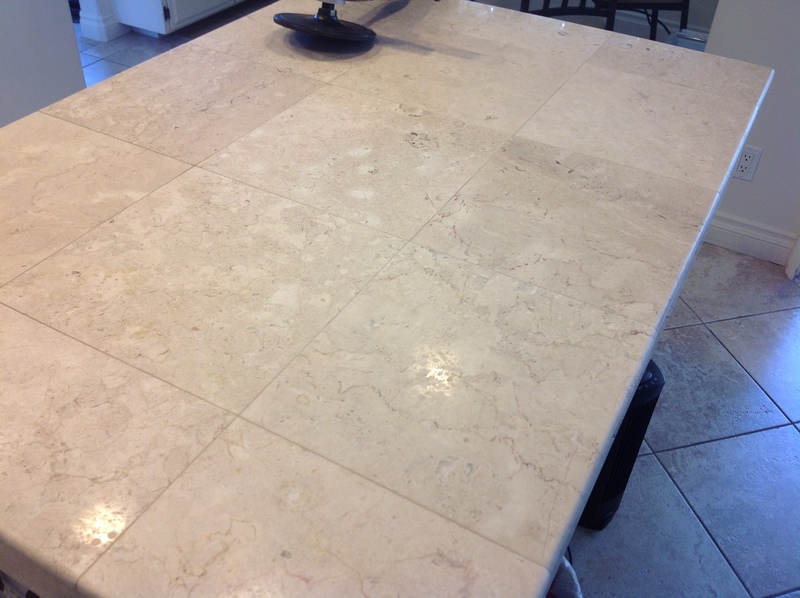 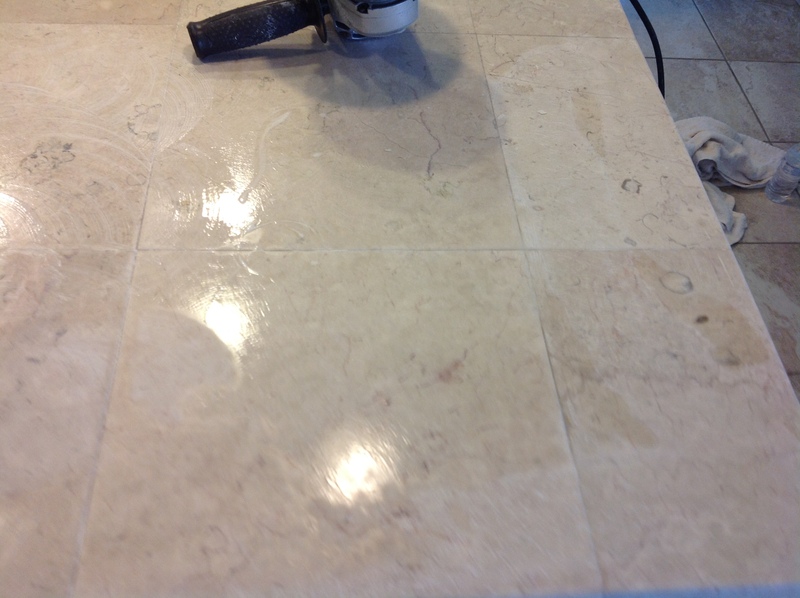 Last step is to seal the marble and grout with a below the surface penetrating sealer, which will repel water and oils, also making the countertops easier to clean. California Tile Restoration restores and polishes Marble Tile Countertops All throughout San Francisco and the bay area in counties and cities such as, Marin County, Belvedere Tiburon, Marin City, Daly City, San Mateo, San Rafael, Strawberry, Angels Camp, Marinwood, Novato, Aptos, Napa, Santa Rosa, Wine Country, Petaluma, Foster City. We restore marble tile all through northern Ca in Aptos, Los Altos Hills, Los Gatos, Palo Alto, Hercules, Vallejo, Berkeley, Emeryville, Solano County, Sonoma, Fairfield, Vacaville, Davis, Dixon, Sacramento, Auburn, Folsom, Modesto, Stockton, Danville. 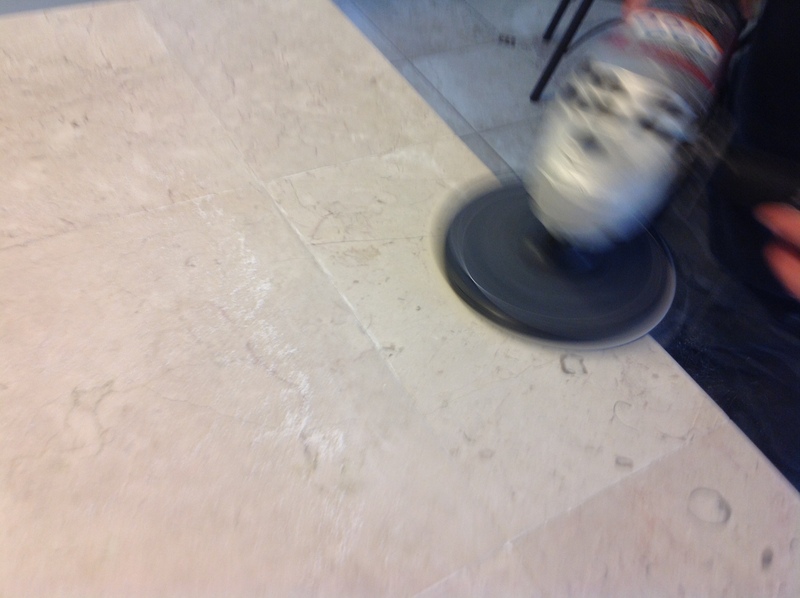 CTR also has serviced San Jose, Milpitas, Dublin, Livermore, Pinole, San Ramon, Thousand Oaks, Crockett, Monterey, Moraga, Bodega Bay, Mission Bay, Sausalito, Terra Linda, Ignacio, King City, National City, Otay Mesa, Pacific Beach, Ramona, Pacifica, South San Francisco.